Sumbhal and Sindh Valley Trek takes us to the base of Kolahoi Peak (5734 meters) and Tarsar, Marsar Lakes across numerous mountain passes. The trek takes us over high alpine pastures and forests of Lidder towards Kolahoi Glacier or Kolahoi Base Camp. We start our trek from Aru Valley near Pahalgam (the land of shepherds) through pine forests of Satlanjan. We will get to enjoy beautiful views of Kolahoi Peak and retrace back to Tar Sar Lake. The lakes are situated in high mountains of Kashmir at an altitude of 4000 meters and offer pristine views of majestic nearby peaks and fabulous trails through alpine meadows and dense forests. We will walk across rice paddies and corn fields of Sumbal village and from there drive to Srinager, where we will enjoy the spectacular views and enjoy shopping over floating market on Dal Lake and enjoyable stay in Houseboat. It's a comparatively easy trek which takes us to a glacier in such short span. You can enjoy your trek luxury style with porters and horse rides to complement your trek thus making it a memorable experience. We trek through land of shepherds across Lidder River and enjoy views of the glaciated valley with waterfalls, blue alpine lakes and green meadows and camping beside magnificent Tar Sar Lake. An optional extra day can be arranged to hike to the Tar Sar lakes from the base camp in Lidder Valley. Arrive at Srinagar and enjoy the lovely weather and pristine views of Kashmir. 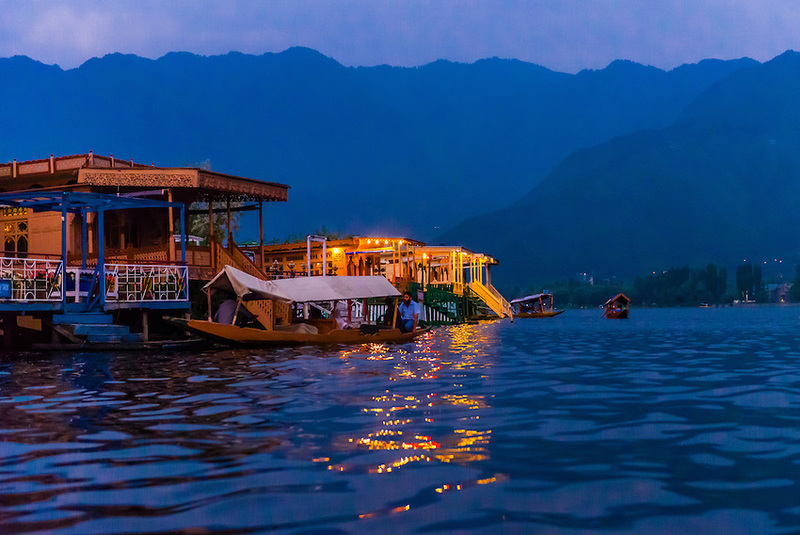 Enjoy shopping over floating market and have a luxury stay in one of the finest houseboats of Dal Lake. Next day prep up for sight seeing across Srinagar while leisure walk of Mughal Gardens and Shalimar Bagh build during 16th Century. Visit Handicraft center for shopping beautiful handcrafted and hand knotted silk carpets and famous Pashmina Shawls. Also on your way back visit the famous Shankaracharya Temple. Today we will make an early start for a long drive to Aru Valley via Pahalgam and enjoy the lush green scenery amid snow capped peaks and beautiful meadows and views of the valley along flowing river. Enjoy leisure walks in the afternoon for acclimatization. Today we will be having a short trek towards Lidderwar while enjoying the walks along the milky blue Lidder River in the company of snow capped mountain peaks. We will be crossing a river stream and walk across thick pine forests and lush green meadows. We will cross a bridge and camp at Lidderwal near river. Today will be a long and tiring day so we start early as the gradient towards Kalahoi Base is hard over moraines. We will come across Satlanjan which is a beautiful base camp for an optional stay thus extending the trip for another day. In this case we will proceed after lunch from here. We will reach glacial moraines and will continue our ascent on the tough terrain while enjoying spectacular views of Kolahoi Peak. We will climb a little higher on the ridge to enjoy better views of the peak and nearby mountain ranges. The descent and walk back towards Lidderwal will be easier. We will camp at Lidderwal tonight. Today we will start early in the morning to enjoy the beautiful trek route of Tarsar which is among the best in Kashmir to reach the magnificent alpine lake situated at 4000 meters while enjoying spectacular views of Kolahoi Mountain range. Tarsar is an almond shaped lake surrounded by alpine flowers. We camp alongside Tarsar tonight and enjoying beautiful views of the stars. Today we will begin our trek towards the twin sister lake of Tarsar which lies on the opposite side of the mountain facing Tarsar Lake. It will be a short but steep ascent over hills and the following ascent will lead us towards Marsar and enjoy the spectacular views of the Lake. We camp here tonight. We will cross Seikwas (3500 meters) which is a usual camping ground for trekkers and follow through a steep ascent across Sonamous Pass (4000 meters) and enjoy the beautiful views from up there. From there it's a steep and tiring descent to the village of Sonamous. From Sonamous we walk across a little defined trail to reach Sumbhal Village after crossing rice and corn fields. From here our vehicles will be waiting for you to transport you back to Srinagar in your houseboats with beautiful memories and loads of beautiful pictures.